There are a number of things I nearly always have in my kitchen. Top of the list: a can of coconut milk, onions, nuts, and spices. This puts me just a vegetable or two away from a flavorful pot of richly-colored curry. The one I'm featuring today is a favorite of mine and one I make often. 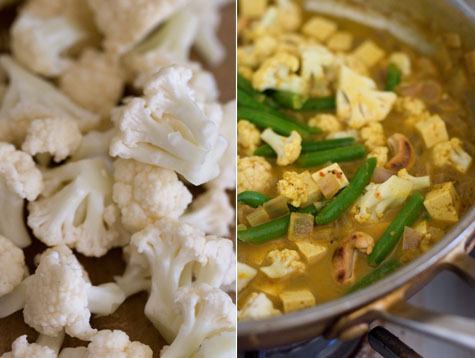 I use a homemade Sri Lankan-inspired curry powder, deeply toasted cashew nuts, a handful of green beans, two handfuls of tiny cauliflower florets, and a bit of tofu for good measure. I might serve it over a bowl of grains, worked into an omelette or crepe, or like this - on its own. I should mention that while I like this particular curry blend, other nights I might take the spices in a different direction entirely - for example, by using a Thai-inspired curry paste instead. I decide what to include in a curry by thinking about a few things. I like a hearty, substantial curry when the weather is cold. And a lighter, brothy one in warmer times. Root vegetables, potatoes, cabbage, chickpeas and the like when it is stormy. Fresh peas, asparagus and other farmers' market finds as spring comes around. I was just home from the airport when I made this one (no time to head to the market), and grabbed for some green beans from the freezer. Worked great. Play around with what you've got locally, seasonally. It's hard to go wrong. 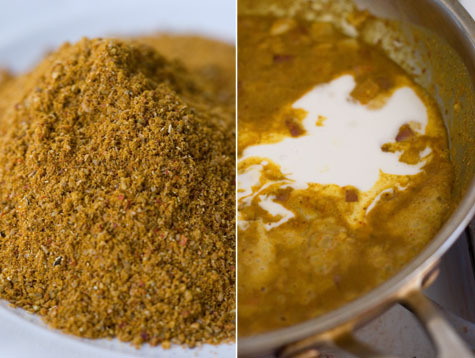 I've included a recipe for one of the curry powders I like to make at home from scratch. It has evolved gradually from a recipe I jotted down years ago in a train station south of Colombo, Sri Lanka, featured in an English language publication. How authentic is it? I'm not too sure. But at this point I'm not splitting hairs. I love the warming spices accented with plenty of kick from the dried red chiles, and sometimes if I'm in the mood for more heat I'll add extra. The turmeric gives everything it touches a stunning golden hue while playing along with toasted cumin to deliver an earthy finish. That being said, feel free to experiment with or substitute your favorite curry powder here. There are few things as satisfying as cooking with your own freshly ground curry powder. I've included a favorite curry powder recipe below. * I use an electric spice grinder, and then sift the powder through a sieve to rid it of any remaining over-sized particles. Feel free to play around with other seasonal vegetables here. And as I mention up above, feel free to experiment with other curry powders as well. Because each curry powder is different, if you aren't sure about the amount of curry powder to use, start with a little on the front end, and add a bit at a time (after you add the water), until it tastes good to you. Bring half of the coconut milk to a simmer in a large skillet or pot over medium-high heat. Whisk in the curry powder and salt, working out any clumps. Now stir in the chopped red onion and garlic and cook for a minute. Stir in the remaining coconut milk and the water, and then the tofu. Cook down the liquid for a couple minutes before adding the green beans and cauliflower. Cover and simmer for just about one minute, maybe two - or just until the cauliflower and beans lose their raw edge and cook through a bit. Remove the pot from heat and stir in the cashews. Taste and adjust the seasoning (salt / curry powder) if needed. Serve with a bit of cilantro topping each bowl. *I like to make my own curry powder on occasion using the freshest whole spices I can come by. This curry powder has evolved from one I read about in Sri Lanka a few years back - if you like more heat, add another red chile or two. In a dry skillet over medium heat toast 4 dried red chiles, 1 tablespoon coriander seeds, 1 tablespoon cumin seeds, 1 tablespoon fennel seeds, 1/2 teaspoon cardamom seeds, and 1/2 teaspoon whole cloves. Toast for just a minute or two or until the spices are deeply fragrant. Now use a spice grinder to grind the chiles into a powder first, remove them, then grind the spices - it usually takes a couple minutes in the grinder for each. Place in a small bowl and stir in a scant tablespoon of ground turmeric, and 1/2 teaspoon of cinnamon. Sift through a medium-fine sieve to weed out any clumps and your curry powder is ready to use. Makes a scant 1/3 cup.